Most localization systems use the GPS signal to locate a person or an object, but GPS does not work inside buildings. With our technology you are able to accurately determine the position of a person or an object down to a few centimeters even inside buildings. Static systems and dynamic companies are incompatible. Therefore, we offer you a product that is just as flexible as you are. Our indoor localization system is scalable and can be extended at any time. If necessary, even during operation! Indoor localization systems should be so easy, that they can be operated and setup by anyone. Therefore, we are taking great effort to make installation and user guidance as easy as possible. Our step-by-step tutorials and video tutorials help you to unlock the full potential of our product solution. 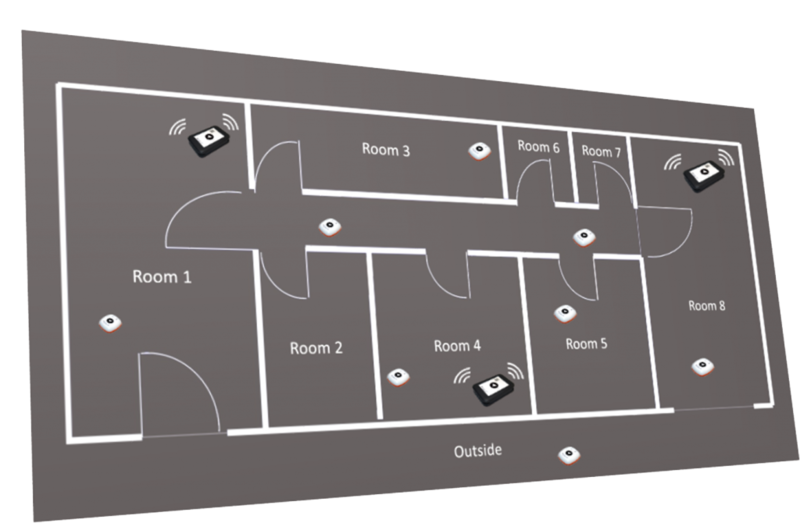 An indoor localization system, also known as indoor positioning system (IPS) or real-time location system (RTLS) works similar to a GPS, but also inside buildings. Due to the fact that GPS receivers can not receive the transmitted GPS signals from satellites inside buildings, the receiver can not locate itself. This is different when using an indoor localization system. Indoor localization systems have their own infrastructure that allows localization inside buildings. We offer ready-to-use indoor localization systems as well as hardware for your own research and development. In addition to completely finished solutions, we offer development services and consulting to realize your project. Please do not hesitate to contact us. Localino has its own "satellites", also called "anchors". The mobile receivers are called "tags" and can locate their position based on the available anchors inside a building. Anchors and tags precisely measure signal propagation delays in the order of sub-nanoseconds, resulting in centimeter-accurate location. Any person or object wearing a tag can be located. Would you like to know more about indoor localization? Know which technology fits your application? Download our free Localino Indoor Localization White Paper. © 2019 Localino - Solutions for Indoor Localization. All rights reserved.